Ethnonyms are particularly difficult to deal with in historical documents about Africans or the African diaspora. They may correspond to socio-cultural affiliations, political affiliations, language, or place of origin. Moreover, the meanings associated with ethnonyms change over time and may be different for different historical actors. Finally, it is not always clear if ethnonyms were self-reported or ascribed to individuals. Even if they were self-reported, identity is a fluid construct, and individuals may have self-identified differently in different contexts. Even with these challenges, ethnonyms remain important for some historians of the Atlantic slave trade. Their importance lies in tracing African groups with similar ethnonyms across the Atlantic Ocean. Similar ethnonyms mean shared socio-cultural traits and thus the possibility that African groups maintained cultural traits as slaves in the Americas. This is an argument against enslaved Africans arriving in the Americas with no culture or affiliations to other Africans aside from the trauma of the Middle Passage. The data for ethnonyms, however, is quite varied in historical datasets. Take for example two datasets in Slave Biographies, a digital project run by Matrix with funding from the National Endowment for the Humanities. The Maranhão Inventories Slave Database compiled by Walter Hawthorne includes inventories of slaveholder possessions from one region in Brazil from 1767 to 1831. There are 7,845 enslaved persons identified by 99 different ethnonyms. 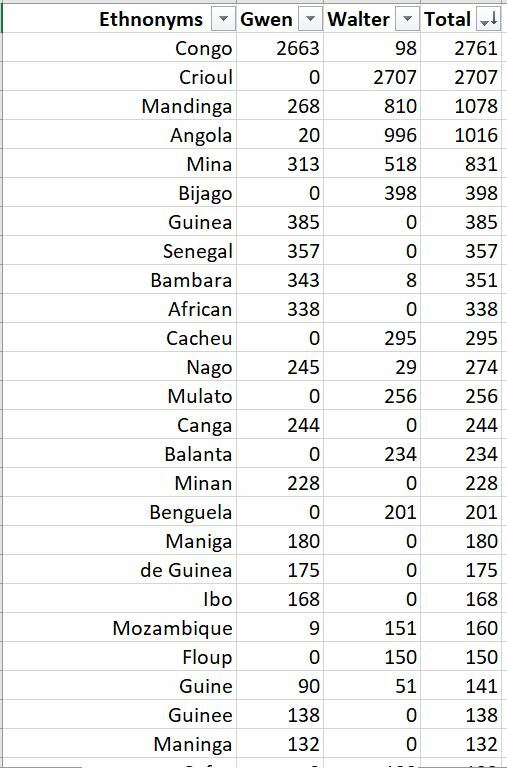 The above table shows the most frequent ethnonyms recorded in the Louisiana and the Maranhão datasets. The challenge for historians of the Atlantic slave trade interested in this data is grouping ethnonyms together into useful categories. This involves a historical understanding of ethnonyms as related to possible group identities and shared socio-cultural characteristics. The next challenge is finding evidence for African cultural influences and that is far outside the scope of this data.